A short drive over the Golden Gate Bridge from San Francisco, the small bohemian city of Sausalito is famous for its exquisite ocean views, artist residents, and rows of houseboats, whose famous inhabitants have included singer Otis Redding and poet Shel Silverstein. For an international couple from England and Australia, the move to the area meant transforming a dark, cramped home into a space that channels the artistic spirit of Sausalito, while giving it a modern twist. The family enlisted Feldman Architecture to help with the overhaul. 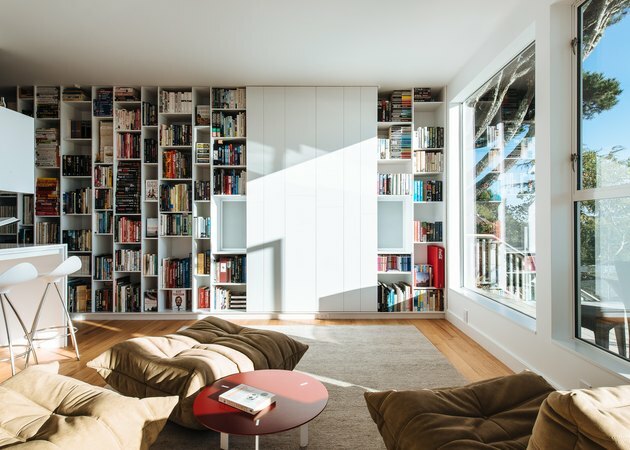 Architect Lindsey Theobald explains that the biggest challenge throughout the project was creating a space for the client's extensive music and book collection. "The bookshelves along the walls maximize storage but also use a fun patterned geometry to keep it interesting," Theobald said. "We kept everything white to accommodate the mixture of colors coming from the books and memorabilia." The other priority was bringing in more light to help highlight the family's style and emphasize the absolutely jaw-dropping ocean views. 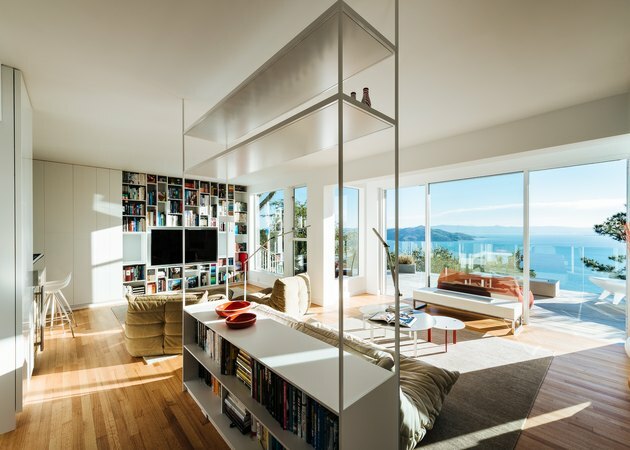 The living room features enormous picture windows that frame the views of the bay. Two fireplaces, one here on the living room level and the other on the library level, were fabricated by Concreteworks. Metal legs for the fireplaces were made by Phil Tiffen. A bookshelf built by Brian Eby of Eby Construction doubles as a see-through space divider that provides storage without obstructing views. Many of the existing bulky exterior decks were pulled out to make room for a sleeker, more minimalist design. 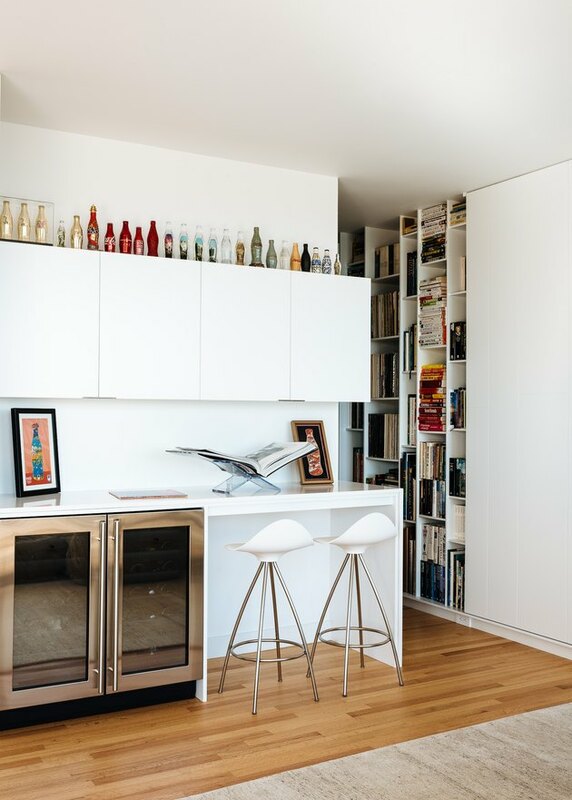 A custom cabinet and shelving unit allows the family to organize and display their book collection. The firm made it a priority to introduce more natural light. The walls were painted in a bright Benjamin Moore Super White in order to reflect the light coming in from outside. 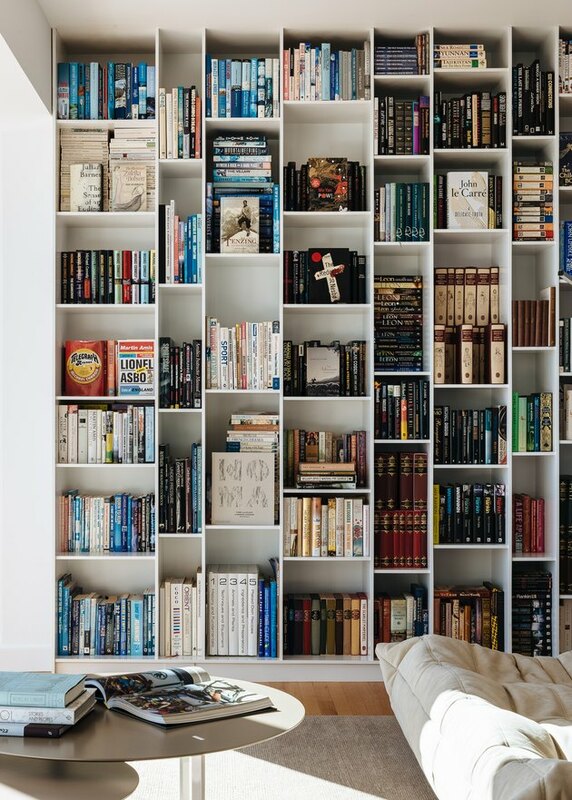 A decor trick that never gets old: arranging books by color to create a gorgeous progression of hues. 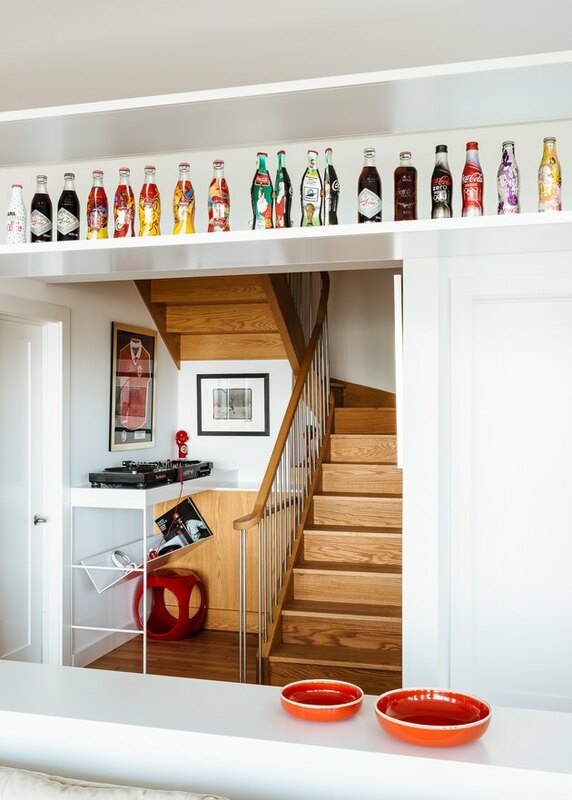 A row of collectible bottles sets a fun tone for the bar area, custom-built to include two wine coolers. Onda bar stools by Stua are inspired by ocean waves — a perfect touch for the coastal home. 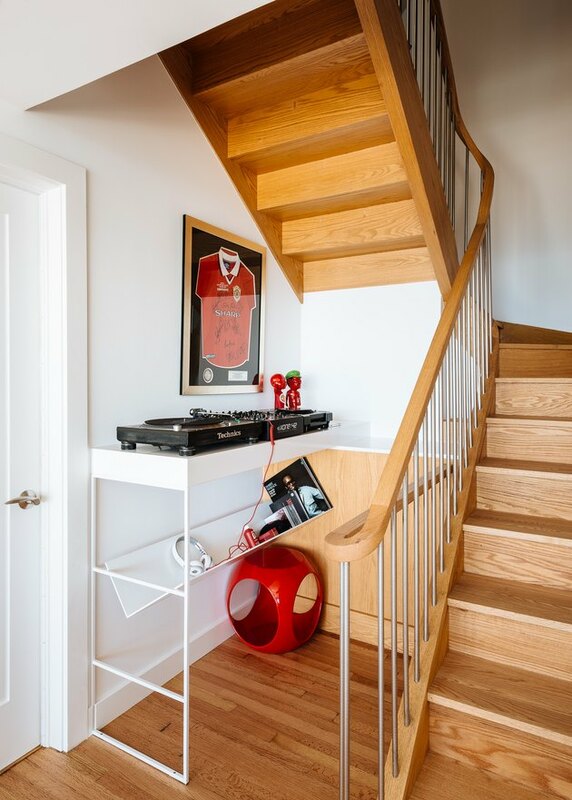 The architectural firm worked around the existing staircase and railing, which fit the style of the renovation. As if these folks couldn't get any cooler, there's also a small, custom-built DJ station. On the bottom floor, a dark media room was transformed into a space for entertaining. 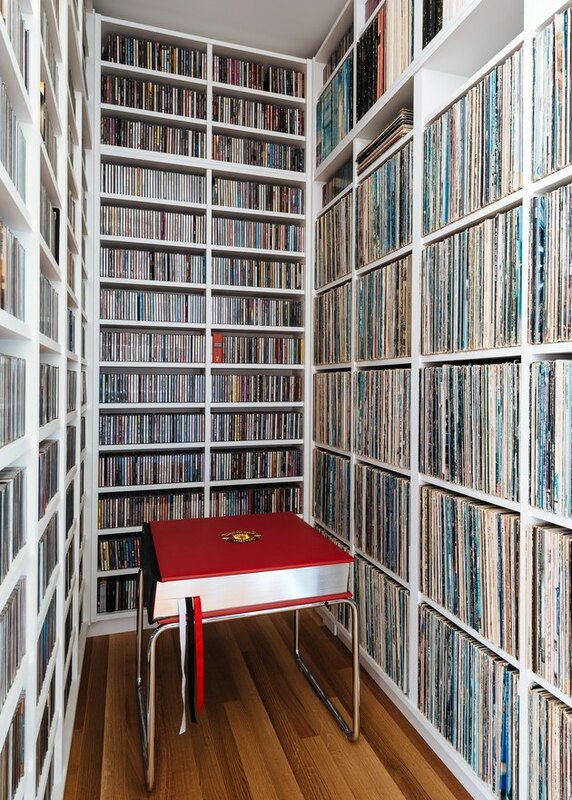 "We used book and music storage as design elements to shape the room's space and aesthetic," Theobald said.